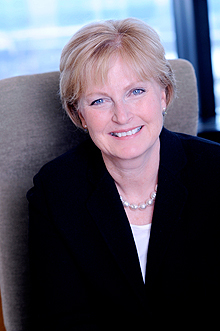 Augsburg College will welcome Mary K. Brainerd, a national leader known for her business acumen and unwavering commitment to the community, as the next featured presenter in the Clair and Gladys Strommen Executive Speaker Series on April 4. Brainerd, who will speak on the topic of health care reform from 5 to 6:30 p.m. in Sateren Auditorium, is the president and chief executive officer of Minnesota-based HealthPartners—the largest, consumer-governed, nonprofit health care organization in the United States. Brainerd and HealthPartners are widely recognized for charitable community work. "Mary is a leader whose values and skills are placed in service of the common good," said Augsburg President Paul C. Pribbenow, who views Brainerd as an important collaborator with the College. "Recently, Mary has joined with colleagues from the health care and education institutions located along the new Central Corridor light rail line to explore how our 'anchor institutions' can help promote the economic well-being of the neighborhoods along the line," Pribbenow said. Brainerd has been actively involved in the Twin Cities community for several years, and she is one of the founding CEOs and former Chair of the Itasca Project, a group of 40 government, civic, and business leaders addressing the issues that impact long-term economic growth, including jobs, education, transportation, and economic disparities. Brainerd has led of HealthPartners since 1992. During her tenure, the organization has received numerous accolades for outstanding patient care and its health plan service. Light refreshments will be served prior to the event and a pizza dinner will be hosted at 6:30 p.m. The Strommen Executive Speaker Series is a free presentation offered quarterly that brings local business leaders to Augsburg's Minneapolis campus to share their insights and expertise. Under Brainerd's leadership and direction, HealthPartners has experienced record growth and is often recognized as a national leader in health care. In her role, Brainerd leads more than 21,000 employees in the HealthPartners integrated system, which includes a care delivery system with more than 1,700 physicians at nearly 140 primary, specialty and urgent care clinics, five hospitals, a large dental practice, 1.4 million members in top-rated medical and dental health plans, and HealthPartners Institute for Education and Research. Brainerd has received honors that include Executive of the Year from the Minneapolis/St. Paul Business Journal, the Caux Roundtable Award for outstanding citizenship, and induction into the Minnesota Business Hall of Fame. She holds a master's degree in business administration from the University of St. Thomas and a bachelor of arts degree from the University of Minnesota. Share your Strommen Executive Speaker Series experience using social media. The hashtag for the series is #AugStrom.